I met Darren Criss and Chord Overstreet at a party in Toronto after the Much Music Video Awards. I was waiting in line at the bar to get a drink when I noticed Chord standing in front of me, so I introduced myself. As we were chatting, Darren Criss came over and joined the conversation, so the three of us spoke about music for a while. 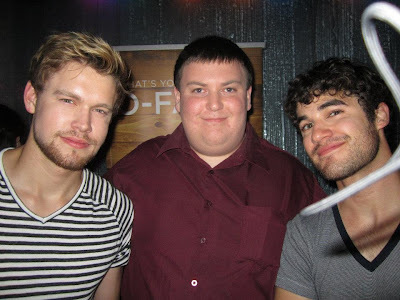 Both Darren and Chord were nothing but friendly. Anyone who asked for a picture got one, and I also noticed how friendly they were with the staff at the nightclub, which is rare for other celebrities I've encountered."